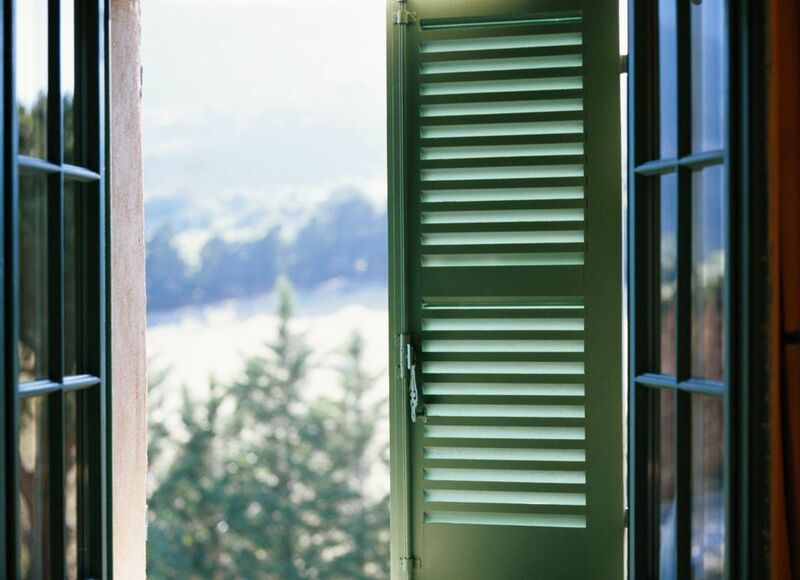 Louvers, in installations such as louvered doors or window shutters, are an attractive way to provide privacy and security while allowing for the free-flow of air on both sides of the louvers. 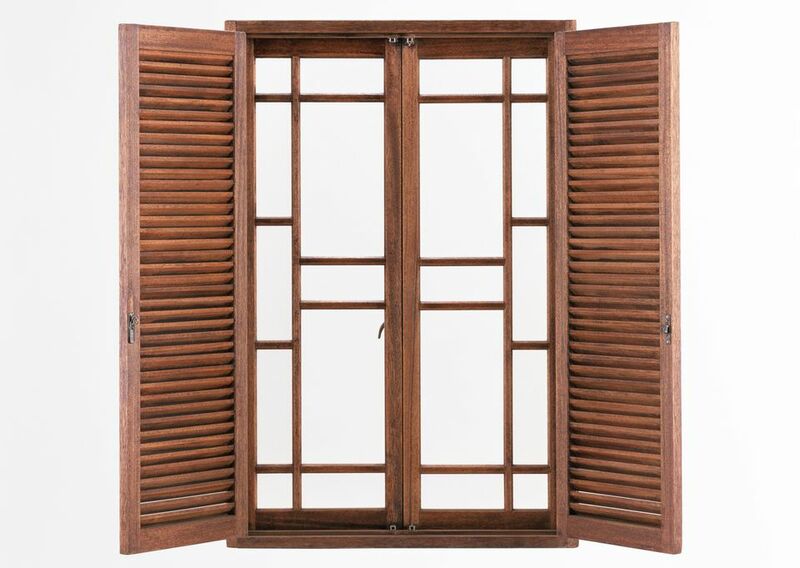 Many people will buy louvered bi-fold doors for closets or position them as a screen for a dressing area. What many woodworkers don't realize is just how easy it is to make louvers. The key is in a jig for use with your router, as a proper router jig will make it quite simple to align your louvers evenly. In this set, we build a shutter for a window that is inconveniently positioned in a shower enclosure. However, the same principle is easily adapted for any interior door or exterior wood shutter, using the same mortise and tenon joinery for the rails and stiles. Download the to build a set of Louvers (PDF). Please note that these plans are more of a guideline on how to build louvers that will fit your particular installation, and not a typical complete set of measured drawings (as the object sizes in the plans will need to be adapted to the dimensions of your particular installation). To build these louvers, you'll also need to download them to build the router jig required to make your set of Louvers (PDF). The first step is to cut the rails and stiles for your particular set of louvers. However, since each installation is different, you'll need to know some principles before you can begin your layout. Each slat in the louvers will cover one vertical inch of space. We'd suggest that you leave a 1/8" gap between the top and bottom slats and the corresponding rails. For instance, if you have approximately a 24" tall opening for the louvers, you'll want to make the opening 24-1/4" and insert 24 angled slats at one-inch intervals. Additionally, each seat will be inserted into a 1/4" deep groove in the stiles, so the slats must be formed as 1/2" longer than the width of the opening. Once you know the dimensions of the door, window shutter or other installation, you can determine the length and width of the rails and stiles. Use your best judgment as to how wide each of the rails and stiles should be ripped to maintain the integrity of the entire unit. These rails and stiles left us with an opening of 18" x 25-1/4". This means that we needed 25 seats of 18-1/2" x 1/4" thickness ripped out of a second 2x4. TIP: Be sure to cut a few extra slats, as you'll likely want to cull a few that have some knots or other imperfections. Round Over the Slats. (c) 2008 Chris Baylor licensed to About.com, Inc. The next step of this woodworking project is to round over the four long edges of each of the louver slats. Set up your router in your router table with a 1/8" radius round over bit equipped with a bearing tip. Adjust the depth so that the lower edge of the round over is flush with the top of the router table. Then, place one salt flat on the router table (as shown in the picture) and ease the four long edges by pushing the seat along the bearing and down each of the long edges. On a router table, always move the stock from left to right, against the rotation of the bit. Any attempt to move the stock in the opposite direction may cause the bit to grab the stock and force it out of your hands. After the four long edges on all of the slats have been rounded-over, sand all of the slats with a random orbital sander or 1/4-sheet sander. Use progressively finer grits of sandpaper to remove the sanding marks from the previous sanding. If you plan to paint your project, 300-grit final sanding should be sufficient to remove all sander marks and leave a smooth surface for painting. If you plan to stain your project, or if you want to ensure an optimum surface, consider a hand sanding with some 400-grit sandpaper for a very smooth finish. Set the seats aside for the time being. Cleaning the Mortise. (c) 2008 Chris Baylor licensed to About.com, Inc.
We'll now turn our attention to the mortise and tenon joints that will hold the frame together. You'll need to cut a mortise in each style for each of the tenons (to be cut on the ends of the rails in the next step). TIP: Remember, when forming mortise and tenon joints, it is always easier to cut the mortises first then fit the tenons to the mortises rather than the other way around. Probably the easiest way to form mortises is with a dedicated mortise, which is essentially a drill press with a square chisel surrounding a drill bit. The drill bit in the center removes most of the stock, while the square chisel does the rest. This allows the operator to drill square holes, perfect for a mortise. Some drill press manufacturers offer optional mortise attachments with various sizes of square chisel bits. However, if you don't have a mortise, there are some other ways to create an appropriate mortise. You could mark out the mortises and remove most of the material with a drill press or power drill, then clean up the mortise with a sharp chisel. You could also use a straight bit on your router table in place of the drill bit, by easing the stock down onto the bit, moving along the fence and then raising the stock back off of the bit. To make a wider mortise, simply move the fence a bit and take another pass. Then, clean up the mortise with a sharp chisel. Your mortises should be about half the width of the stock. In our case, the stock is 1-1/2" wide, so we made our mortises 3/4" thick, centered in the width of the stile. And since we won't want to see the edge of the tendon in the bottom of the frame, we'll cut the mortise back 1/2" from each end. On our 2-11/16" wide rails, we made a 1-11/16" wide tenon, so we were sure to start the mortise back 1/2" from the edge. Cutting the Tenon. (c) 2008 Chris Baylor licensed to About.com, Inc.
Set the depth of cut to match the width of the amount of material you left behind when you cut the mortise - in our case; we will be cutting out 3/8" off of each wide edge to leave behind a 3/4" thick tenon. If you're using stock thicker than 1-1/2" then you'll need to adjust the depth of cut. After cutting the two flat sides of each of your tenons, adjust for a deeper cut (1/2" in our case). Then turn the stock on its side and make the remaining cuts of the tenons. TIP: Always cut your tenons a bit larger than their finished size to begin, then try to dry fit the tenons. If they don't fit, cut them a little further and make any adjustments that you deem appropriate to ensure a perfect fit. After all of the mortise and tenon joints have been cut and dry-fitted properly, disassemble the joints and mark the corresponding joints in discreet locations, so you know how to re-assemble the frame in the final assembly. Then, sand all of the exposed sides of the rails and stiles. A Completed Louver Jig. (c) 2008 Chris Baylor licensed to About.com, Inc. The key to making louvers is in the grooves for the slots in the stiles. If the grooves aren't properly spaced or parallel, the louvers will look odd. There is a simple solution to this potential problem: a louver jig for your plunge router. That can be built out of scrap stock and will ensure every groove will be perfect. If you check back to the plans you downloaded in step 1; you'll find a four-view measured drawing of the router jig. To begin, you'll need two long (at least 24") boards that are a bit thicker than the width of the style that you'll be routing. These don't have to be solid boards; you could use a couple of pieces of scrap 3/4" plywood and shim some other scrap stock beneath the two boards to raise them to the proper height. Make sure that the channel between the two long boards is clear. Next, position one piece of 1x2 in a 45-degree angle (using a layout square) a few inches to the right of center on the two parallel boards. Adjust the width of the parallel boards so that they match the thickness of the stile (on edge - this would be 1-1/2" if you used 2x4s to make the stiles). Affix this 1x2 to the two long boards with screws. Now, position your router with a 1/4" radius straight-cutting bit on the two long boards, butted against the left side of the angled board you just attached. Position a second board parallel to the first angled board, on the other side of the router base. Attach with screws. Next, you'll need a piece of scrap the same size as the style to be grooved. Mark a line across the width of the same edge of the board as the groove to be cut in style. Make a mark at the center of this line, then make a 45-degree mark (in the same direction that you positioned the router guides in the last step) through the intersection. Make a mark at 3/4" in each direction from a center point on this line. Routing Louver Grooves in a Stile. (c) 2008 Chris Baylor licensed to About.com, Inc. Position this board with the center mark directly under your router bit on the jig. Remove the router, and make a pencil mark on the jig that that corresponds to the first 90-degree mark you made on your test board. This will be the alignment mark for positioning your style when you cut the grooves (as shown in the image above). Put the router back on the jig and move it forward to the point where the edge of the bit meets the far 3/4" mark on the diagonal. Find a short piece of scrap 1x2 and position it against the router base on the jig and screw it into place. This is a stop to keep you from routing too close to the edge of the stile. Move the router toward you in the jig until you reach the other 3/4" mark on the diagonal line and attach another stop block against the router base for the bottom side of the jig. You should now have 1-1/2" of travel perfectly centered on the test style. Set your router to make a 1/4" deep cut and clamp the jig and test style to your table. Route a test groove, remove the style and dry-fit test the fit with one slat. Adjust the jig if you aren't happy with the fit. Next, we'll set up one style for cutting by making a perpendicular mark every one inch along the edge of the stile to be grooved. Start by making a mark at the halfway point of the length of the style. If you have an odd number of grooves to cut, make one mark on each side of the center every inch until you have the requisite number. If you need to cut an even number of grooves, you must make a mark 1/2" on each side of the centerline, then a mark every inch on each side until you reach the desired number of slats. With all of the marks completed, clamp the style to the table and route the first groove. Then, remove the clamp, slide the style to the next mark, clamp, and route. Continue until all grooves have been routed. Inserting the Louver Slats. (c) 2008 Chris Baylor licensed to About.com, Inc.
With all of the grooves cut in one style, you'll need to build a second jig (or disassemble the first jig) and repeat the same instructions from the past two steps in the opposite 45-degree angle. Once you have a matched set of grooved stiles, dry-fit the slats in one of the styles as shown in the picture on this page. Then, evenly brush a bit of glue into the two mortises (three if you're making a door) on this style and the appropriate rail tenons, then slip the tenons into the mortises. Immediately wipe off any glue that squeezes out of the joints. Next, brush some glue into the mortises on the remaining style and the two (or three) remaining tenons. Position the tenons into the mortises and, working quickly from one rail toward the other, place the individual slats into the proper grooves of this style. Clamping the Louver Assembly. (c) 2008 Chris Baylor licensed to About.com, Inc.
Once you have all of the louvers in their appropriate slots and the tenons securely into their mortises, clamp the styles together using some long clamps. Be sure to clean up any glue that squeezes out of the joints. You should also check the unit for square by cross-measuring the assembly from diagonal to diagonal. If the cross-diagonal measurement across two corners matches the measurement across the other two corners, the unit is square. Applying the Finish. (c) 2008 Chris Baylor licensed to About.com, Inc. The final step applies the finish of your choice to the louvered assembly. While you may choose to brush on your finish, I find it easier to spray the finish. If you choose to paint the louvers, be sure to give it a couple of thorough coats of primer before adding a couple of coats of the final color. Should you choose to stain the louvers, you'll likely need to apply the stain with a brush, but you can spray on a few coats of polyurethane or lacquer as a final finish.